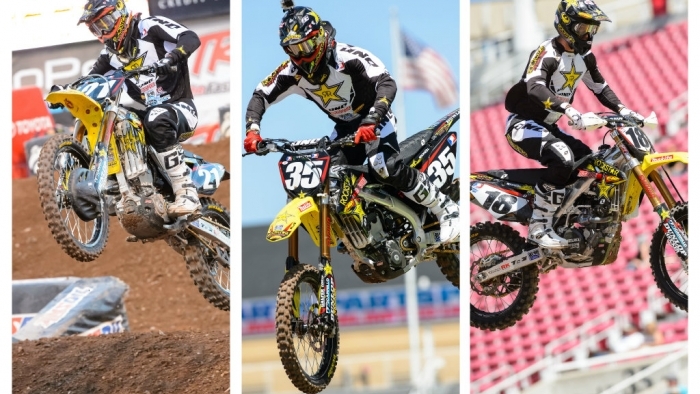 Rockstar Energy Racing headed into the mountains in Salt Lake City for the penultimate round of the 2013 Supercross Championship. At an elevation over 4000 feet, the bikes are underpowered and the riders have little time to acclimate to the thinner air. For the first time in several years however, the weather was incredible. With crystal clear skies, perfect temperatures for racing and the Wasatch Mountains creating a picturesque backdrop visible from inside the stadium. SLC presented without a doubt, the toughest set of whoops this season. They were big, abrupt and hard packed. While that description makes most riders cringe, it's like a gift to Davi Millsaps. Top riders were struggling and dreading them all day. Davi looked at times like he was just going down a straightaway, staying on top of them like they weren't even there. Millsaps was the fastest by a significant margin all day in practice. His heat race was more of the same, crossing the finish line first with Ryan Villopoto in tow. As the first lap of the 450 main event unfolded, all 3 title contenders were up front. Davi moved by Ryan Dungey for second place and began to close on Villopoto. The trio stayed in those positions for the entire race. Typically when a freight train like that takes place, the race is considered boring. This was quite the opposite. Sometimes Villopoto would pull away. Then Dungey would catch Millsaps. Then Millsaps again would be all over the lead. It was an amazing race with 3 intense competitors. It was very evident that they were giving it their all and it was exciting for all fans in attendance at the edge of their seats. When the race concluded they were way ahead of the rest of the pack, all satisfied with their efforts and all had been pushed to their limit. Davi Millsaps: "I gave it everything I had. I seriously had nothing left in me when I crossed that finish line. I was so happy to see the checkers. Ryan Villopoto ran a good last half of the season and I ran a bad one. It was a great run and it was fun racing against those guys. Definitely congratulations to Villopoto. He rode like a champion. It was a learning year for me, I've never been in the front, never had the points lead, let alone have this many podiums. All in all it's been a good season so far and I'm definitely looking forward to next year." Jason Anderson really put everything together in Utah. Competitive all day in practice, then nearly catching the leader in his heat race en route to a 2nd place qualifying position. His main event was virtually flawless. Jason got a good start, rode a very smart race and kept his nerves calm for the entire 15 laps. Anderson started in 3rd, then in no time at all moved his way into the lead. He rode out front like veteran would, like a rider who had done it many times. It's been a long road since Jason's rookie season and all his hard work showed Saturday night. Once he got into the lead, he stayed there for every lap on the way to his first career victory, eventually building a 7 second lead. Now that this kid knows he can win, the rest of the 250 class may be in trouble. Ryan Sipes has had a tough couple weekends to come back to. First, last week returning to a rutty, slick and rainy Seattle Supercross. Then to a tough track in Salt Lake with the elevation variable. Sipes qualified a solid 4th coming through the pack in his heat race. Then in his main he became engaged in a crazy multi rider battle. Everyone from 3rd to 10th was swapping positions. It was like a swarm of bees all criss crossing and flying around the track. Amazing for the fans and fierce for the athletes involved. Yet another tough facet for a rider who has been off the line for several months to overcome. Sipes ended up finishing 7th but could have finished anywhere from 10th to 3rd. He will look to improve next week where he has won the shootout before. Ryan Sipes: " Weekend was rough. I'm a little disappointed in myself. It's takin me a while to get back in the racing mode. I get out there and I kinda just lock up. I'm not flowin and I'm not riding nearly as good as I do at the practice track. If I could ride like I practice, I feel like I could be in the hunt for wins. It's not happening right now. Hopefully I can work on some stuff this week and make it better in Vegas." Rockstar Energy Racing will travel south to Las Vegas next weekend where the temperatures are always high. The team will have 4 main events to try and pick up another victory. Millsaps will look for his 3rd, Anderson his second, Wharton his second and Sipes his first in the final round of this successful season.